Paul addresses this letter to the “saints who are in Ephesus”, although as we learned in the introduction to this letter, some manuscripts do not have “in Ephesus” indicating this may have been a circular letter. The saints were the believers in Ephesus. Every believer in Jesus Christ is a saint. The Greek word for saint is ηαγιοσ (pronounced: hag’ee-os) which simply means “to be set apart; to be holy”. Most people have an misunderstanding of who a saint is due to the widespread, erroneous doctrine of the Catholic Church which teaches that a saint is some sort of super-Christian who has lived an extremely exemplary life on earth and who continues to do so after death (how they know this is a mystery). Catholics elevate these people to sainthood based on man-made criteria. But this doctrine is false as it is not supported in the Bible. The truth is every human being who expresses belief in Christ – and nothing more – for the forgiveness of their sins is saved from the penalty of those sins and is going to heaven for all eternity. These people are set apart by God – they are His children [John 1:12]. God considers them to be holy because their sins are now 100% forgiven; He views them as having no sin. These are the people who, by God’s definition, are saints. Notice that believers are “in Christ”. These two words will be very important throughout the rest of this letter as Paul describes to the Ephesians (and us) what it means to be a saint. Paul will use this phrase 9 times in the first 14 verses and about 30 times in the entire letter as he describes the plethora of blessings and benefits that go along with being God’s adopted son or daughter. By being “in Christ” every believer has the exact same standing before God that God’s son – Jesus – has. If every American citizen has, by law, certain freedoms (religion, speech, etc) then if I am “in America” – if I am an American citizen – then I have those freedoms too. In the exact same way what is true of Jesus is also true of those who have been adopted into God’s family and who are “in Christ”. As well as having many, many more blessings. Paul will describe what it means to be “in Christ” in more depth as we read this wonderful letter. Paul opens his letter to the Ephesians by identifying himself and by calling himself “an apostle”. Here Paul is stating his authority for what is to follow. He knows what he is talking about. This is the equivalent of someone putting PhD or similar credential after their name, indicating that they have the education and experience to be qualified to make certain statements. The Greek word translated apostle is αποστολοσ (pronounced: ap-os’-tol-os). It means “one sent forth with a message”. Paul has a message that he has been tasked with giving not only to the Ephesians but to the Gentile world. He was given this task by God Himself. When belief in Jesus began to spread throughout Israel and the surrounding area after Jesus’ resurrection and ascension to heaven, there were many who opposed it. But no one opposed it more than than a young, Jewish man named Saul. This man was extremely zealous for the traditions of his ancestors and as a result persecuted this new movement, which was known as “The Way” [Galatians 1:14; Acts 8:3, 9:1-2]. But one day while travelling to Damascus to arrest new believers there Saul met Jesus [Acts 9:3-4] who changed his life forever. Saul stopped persecuting followers of The Way and became a follower himself. He changed his name to Paul and began teaching others about Jesus with the same fervor with which he had been persecuting believers. He did not do this on his own. It literally took an act of God. Paul was the fourteenth, and final, apostle. Jesus called the first twelve during his earthly ministry. Judas left the group and was replaced by Mathias [Acts 1:23-26]. Then, finally, Jesus called Saul/Paul along the Damascus Road. These men have a unique purpose in history. They were called to do something special – write Scripture so that God’s message of love and forgiveness could be passed down from generation to generation. They were called by, and learned from Jesus Himself. Once they passed from the scene there would be no more apostles. So clearly Paul has the authority to write this letter to the Ephesians. He is not just some guy that no one knows with an opinion – like me and my blog ☺. The town of Ephesus was the capital of the Roman Empire of Asia. It was situated on the western coast of modern-day Turkey [Google Map] and was the most important commercial center of Roman Asia. On Paul’s third missionary journey he stopped in Ephesus after finding some people there who were believers, but who weren’t quite accurate in their understanding [Acts 19:1-7]. He stayed there for almost three years, initially preaching in the synagogue but later having to leave there due to opposition to the gospel message. He then preached in the hall of Tyrannus for almost two more years [Acts 19:8-10]. 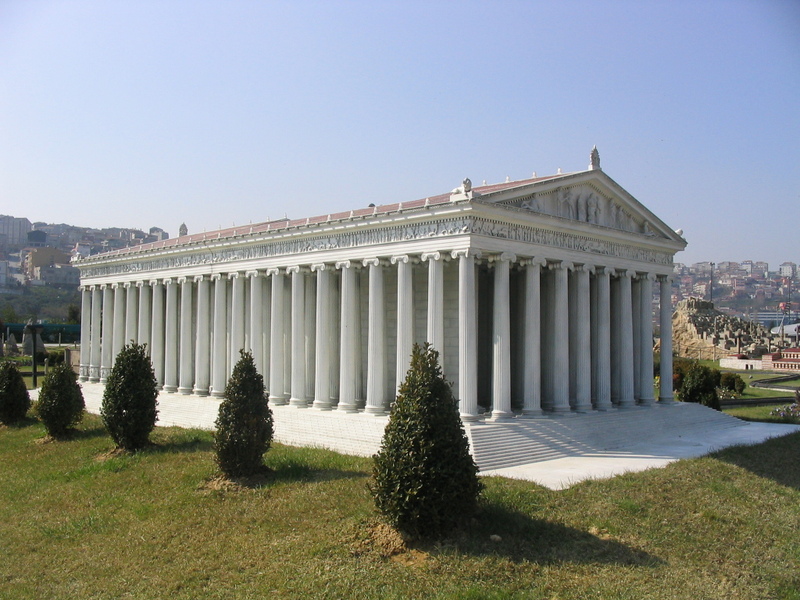 One of the interesting features of Ephesus was its Temple of Diana (aka Artemis). This was one of the seven wonders of the ancient world. From inscriptions which have been excavated in Ephesus, we know that the city was extremely proud of having this temple in their jurisdiction. It brought respect from surrounding cities, not to mention income. A great many people earned a living selling trinkets with Diana’s image on them. But when Paul began teaching about Jesus in this city those businessmen became enraged out of fear that the demand for Diana souvenirs would dwindle as people gave up their worship of their gods in exchange for worship of Jesus. This created quite a confrontation [Acts 19:23-41]. After this Paul left Ephesus [Acts 20:1]. But years later, while in a Roman prison, he would write at least two letters to the church there. One survived and is known as the book of Ephesians in the Bible. This letter is a bit different than Paul’s other letters as it does not address any specific issues in the church at Ephesus. Nor does it mention any specific members of the church there. 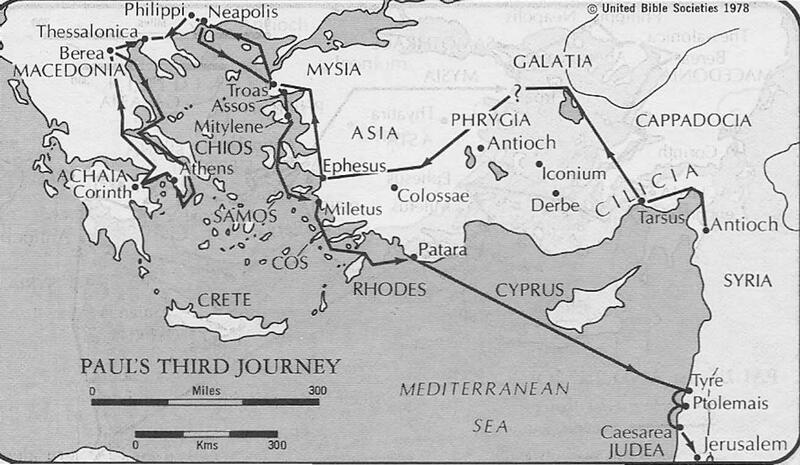 In fact, many manuscripts do not contain the words “in Ephesus” in the opening line [Ephesians 1:1]. It appears that this letter was meant to be a circular letter – one that would have been copied and sent to churches all over Asia Minor with each church’s name being put into the greeting. This seems very plausible when we consider the content of this letter. Rather than focusing on specific issues, it focuses instead on general spiritual truths that every believer needs to know (chapters 1-3) and practical behavior that should ensue as a result of these truths (chapters 4-6). These are the truths and behaviors that disrupted life in Ephesus when Paul taught them to the pagan culture there. But it is no less important for us living today to be reminded of these truths as we live in a culture with many false gods that demand our devotion and financial resources. We too need to have our lives disrupted by God’s truth. Greet every saint in Christ Jesus. The brothers who are with me greet you. All the saints greet you, especially those of Caesar’s household. The grace of the Lord Jesus Christ be with your spirit. We conclude our study of Paul’s letter to the Philippians with his final words. Its easy to dismiss the initial and final greetings of Paul’s letters, thinking they don’t have much meaning. But that would be a mistake. Every word in the Bible is useful for study [2 Timothy 3:16] and this last verse is no exception. Just like great literature, Paul’s letters (and other books of the Bible) are intentionally structured to be symbolic of their content. Paul opened this letter with greetings of grace from Jesus Christ [Philippians 1:2]. Now he closes with a benediction for Jesus’ grace to be upon the Philippians’ spirit. Everything he has said is bookended within God’s grace. Paul has given the Philippians some very specific instructions for living including being united and being humble. None of these things can happen outside of God’s grace. Just look at the unbelieving world around us. They know nothing about God or His grace. Hence we see complete disunity, confusion, and selfishness. That is why as the United States, and the world, moves further away from God, things will only get worse. Our country believes that the Bible and God are the cause of many of our problems and that removing them from our culture will make things better. This will not happen. Without God our true human nature will take over and the world will be filled with selfishness and hate and anger. Its safe to say we already see that happening. The definition of hell is the complete absence of God. It is not that God will be torturing people in hell. That is a false teaching. God won’t be in hell at all. Human beings who rejected God on this earth will be completely on their own to run their own lives – which is what they decided they wanted during their earthly lifetime. That is why hell will be so terrible: human nature will run rampant. The only way to escape such an eternity is by God’s grace. God’s grace saves us from the penalty of hell we rightly deserve. But God’s grace also sustains us as we complete our sojourn on this planet. We need God’s grace to live the life He calls us to live. Our inherent human nature can never be humble. It can never be joyful. It can never be selfless. The only way we can live the life Paul describes in this letter is through the grace of God. Paul addressed this letter to the saints in Philippi and now as he closes he again calls them saints. He also refers those in Rome who are with him as saints. This would have included Timothy and other people who were believers. As we learned at the beginning of our study, the term “saint” is misunderstood today because of the erroneous teachings of the Catholic church who have altered the meaning to refer to only an elite few. But this is not biblical. The term “saint” as it is used in the Bible simply means someone who has been set apart by God. It always refers to those who are “in Christ Jesus” – anyone who has been born again by faith in Christ’s payment for their sins. Its very interesting that there were believers in Caesar’s household. Caesar at this time was Nero, a very wicked ruler who murdered many members of his own family and who was also a persecutor of Christians. Yet despite his tyrannical rule, there were those within his family and/or employment who came to believe in Christ. This should be a great encouragement for us today. Many of us work in environments where we are the only believer and those around us seem to have no interest in knowing Jesus. That is probably untrue. Sometimes in such places people are very open to hearing about the hope that Jesus provides because they see much sin (although they may not call it that) around them. Its really no different than being a missionary in a country which is heavily into a false-religion or where the Bible is banned. Just like Paul, our light will shine brightest in the dark. That is why Paul could say that his imprisonment in Rome was for the good [Philippians 1:12]. People were coming to know Christ as their Savior and therefore would spend their eternity in heaven in God’s presence. And that is all that matters. We should not be disappointed at where we are in life. No matter where we are – even in prison or a job we hate – God can use us to reach others. Nor should we be afraid to approach those who seem the most against God’s message. Sometimes the most unlikely of people will believe and in fact are ready to believe if someone simply presents the truth of God’s love to them. Yesterday Paul reminded the Philippians that since they were so sacrificially generous towards him in his time of need, God would meet their every need. This is a promise from God for believers who are generous. After expressing this wonderful truth about God, Paul offers up praise of God in a brief doxology. A doxology is a statement that ascribes glory to God. It comes from two Greek words: δοξα (pronounced: dox’-ah) meaning “glory” and λόγιον (pronounced: log’-ee-on) meaning “saying”. This verse seems like it is a spontaneous outburst. It seems that Paul can’t contain himself after writing the wonderful truth of God’s provision (and all the wonderful truths contained in this letter). This makes sense. When we understand God – when we read the Bible and learn the truth about who He is and what He has done and is willing to do for us – the natural response is to praise Him. Truth leads to praise. When we praise God we glorify Him. To glorify God is to acknowledge His magnificence; to exalt Him to a place in our lives above ourselves; to recognize His greatness, grace, and mercy. This is the purpose of our lives. God created us to worship Him. But we cannot do that if we do not know Him. Certainly it is not possible to know all there is to know about God. He is infinite. But He is knowable. God does not hide Himself from us. He wants us to know Him. To that end He has invited us into a relationship with Him. Just like in human relationships we have to spend time with someone in order to get to know them, the same is true with God. As the relationship progresses we learn more about Him. And when we learn more about Him we can’t help but praise Him. Notice that Paul calls God “our God and Father”. He is not only our God (our creator and source of life) but He is also “our Father”. There is a familial relationship between God and believers. He is our Father and we are His children [John 1:12]. This is a unique aspect of Christianity. No world religion, not even Christian-based ones like Catholicism, views God as wanting an intimate, personal, father/child relationship with us. Religions are man-made attempts to appease and please God. But God doesn’t want our rituals or sacrifices. He wants us to know Him [Hosea 6:6]. And when we get to know Him there is no other valid response than to glorify Him. The Philippians had sent Paul a very generous gift for which he has thanked them. We know from 2 Corinthians 8:1-3 that the people in Philippi were not wealthy so this gift they sent to Paul in Rome was a sacrifice for them. They may have therefore had some concern about their own future financial stability. So Paul reminds them that God promises to meet their “every need”. This verse, Philippians 4:19, is one of the most quoted verses in all of the Bible. But like any verse, it needs to be taken within its context. God isn’t promising to do this for every believer in every situation. Rather, when someone is sacrificially generous towards another in need, as the Philippians were towards Paul, God promises to take care of them by “supplying” what they “need” (not necessarily what they want). The word “supply” in Greek is the word πλεροο (pronounced: play-ro’-o) which means “to fill to the top so nothing is missing”. God will make sure generous people are never in want of the necessities in life. This theme is seen throughout the Bible. Proverbs 3:9 tells us that when we give sacrificially God will more than replenish us. In Luke 6:38 Jesus says what we give will be returned to us. But notice that we must go first. We have to give up what we have in faith that God will do as He said. When we do God will pay us back “according to His riches”. The words “according to” are very important here. God gives “according to” His riches, not “out of” His riches. If a billionaire gave a homeless person a dollar he would be giving “out of” his riches. But if he gave “according to” his riches he’d give that homeless person thousands of dollars. God isn’t stingy. He has infinite riches. And He gives “according to” those riches to generous people who are “in Christ”. God funnels all His blessings through Jesus. Those who don’t know Jesus – who have not been born again and are therefore not part of God’s family [John 1:12] – cannot partake of God’s riches. But those of us who do can count on this promise. Everyone who has a personal relationship with God through Jesus, as Paul and the Philippians did, can be generous without fear. Such a person never needs to worry about being in need. Yesterday we learned that God wants us to give our money to support the furtherance of the Gospel message. To that end we should be giving financially to our church as well as evangelistic, Christian organizations and missionaries. Notice that as a result of the gift sent by the Philippians Paul was now “well supplied”. He now had “more” than he needed. The Philippians had been very generous in their giving to Paul. When it comes to our money we can be quite protective (i.e. stingy). Certainly money provides some degree of security. It can also be used to buy things we want (but don’t necessarily need). But it is much more important to use our money to spread God’s message than it is to have a new pair of shoes or golf clubs. God wants us to be generous in our giving in the same way the Philippians were generous. Giving generously is a “sacrifice” and God knows this. That is why the Philippians’ gift was “a fragrant offering… a sacrifice acceptable and pleasing to God”. God’s ultimate goal for our life on earth is not comfort, but character development. One aspect of our character He wants to develop is concern for others, as we’ve read in this letter to the Philippians [Philippians 2:4]. When we give to the point where it becomes a sacrifice for us we are demonstrating the heart of God. God was so concerned about our eternity that He made a huge sacrifice in sending His Son to earth to take on the penalty for our sins. He wants us to be just as willing to sacrifice for the sake of others’ eternity. If someone is a born-again child of God [John 1:12] then there is nothing on this earth, beyond necessities, that we must have. Our earthly focus should no longer be on ourselves as our eternity in heaven is secure. Obviously we need to take care of our physical and spiritual health. But beyond that our primary goal in life should be spreading the Gospel message so that others will enter God’s kingdom too. Spreading of the Gospel message requires money. Churches, charities, and missionaries all need to raise funds to pay their expenses. The more generous believers are in supporting these people and organizations the more people will hear about God’s wonderful offer of salvation and will be saved. And nothing pleases God more than that. Yesterday we read how God wants us to be givers. When we give our money to help people it demonstrates care and concern for others. Giving is a selfless act and a selfless heart is what God is trying to develop in us. But this does not mean that we are to give our money to whomever we like. We are to give to those who are serving Christ, as Paul was. Paul was by trade a tent-maker [Acts 18:3]. Once he was called by God [Acts 9] he gave up that trade as a full-time profession in order to study God’s word and teach others. But Paul still needed money to meet his daily living expenses. And although he returned to tent-making part-time when necessary [1 Thessalonians 2:9], he was primarily supported by donations from believers in churches he had planted. Those who teach God’s word need to be supported. That support comes primarily from those people they teach. This means that believers should be giving money to the church they attend in order to support their pastors. The money we give to our church will also be used for programs to teach children and adults, and to support missionaries and evangelistic charities. This does not mean that we can’t give any money to other causes. Giving a homeless person a few dollars is not a sin. Nor is sending a check to a charity that fights cancer or rescues animals. Helping others in general is good and God wants us to do that. But certainly we need to be careful when it comes to some charities that seem to be doing good. A few years ago the Susan G. Komen organization, which allegedly supported breast-cancer research, revealed that it was funnelling some of its donations to Planned Parenthood to pay for abortions. Needless to say, no Christian should be giving money to Susan G. Komen. Giving money to non-Christian charities can be an evangelistic opportunity. There is only one non-Christian charity I donate to – Operation Smile. But when I send them a check I always send it in a Christian “Thank you” card and I write a note thanking them for the work they are doing to help God’s children. God does not give us money to improve our lifestyle. Certainly life may necessitate that at some point we buy a bigger house or a new car. But we should do this out of necessity not out of desire. Nor does God want us to live in poverty. He wants us to have enough food and other things we need to survive. He also commands us to save up money for the future [Proverbs 6:8; Proverbs 21:20]. But beyond that, our money should be used to support those who teach us and to bring other people into His kingdom. Paul has just told the Philippians that he was perfectly content even when he had little because of the strength that came from Jesus in such situations. The Philippians may have read those verses and thought that sending money to Paul was unnecessary or even a mistake. Paul realizes this so he tells them that even so (“yet”) they did the right thing in sending their gift. The original Greek word for “kind” is καλοσ (pronounced: kal-oce’) which means “honorable”. Giving to help others who are in need is commendable. God is pleased when we do such things. God commands His children to take care of others who need help [Philippians 2:4; Hebrews 13:16]. Once a person has been saved through faith in Christ and is part of God’s family [John 1:12] they are no longer to live for self as non-believers do. We are to live sacrificially. Our faith in Christ saves us from the penalty of our sins, which is eternal separation from God (aka “hell”). Our lives from that point serve one purpose: to further the Gospel message to the rest of the world. We do that through various means including practical measures such as volunteering our time and the giving of our resources, including money. It is not enough to simply have faith and be saved and then live a life that is devoted to personal comfort. We are to “share” the troubles of others. The Greek word for trouble could also be translated as distress or discomfort. When a child of God sees another person going through a tough time we should give to them [James 2:14-17]. Doing so alleviates that person’s needs but is also pleasing to God because it demonstrates His love through the giver. When someone gives to another God will reward that person [Luke 6:38; Proverbs 19:17; Proverbs 22:9 et. al]. This is why got Paul so excited about the gift he received from the Philippians. He could live without the money. But the gift itself was a demonstration of the Philippians faith. By giving the Philippians were being obedient to God [Galatians 6:2]. Obedience demonstrates faith. But the Philippians, who were poor as we’ll learn tomorrow, gave to help another in need because they had faith in God to take care of them. Many non-believers have issues with verses like these because they think the church is simply after our money. Even believers have a hard time parting with our money. Money provides security. But as Paul taught us yesterday, God wants to be our security. Of course we need money to live. God is not calling us to live in poverty. But God is more interested in our spiritual health than our financial wealth. Giving to help others is “to our credit” as it does more for us spiritually than money could ever do for us financially.